A short while after I discovered the crocheted cupcake pattern from Bittersweet, and after having perused countless beret patterns, I thought it would be a great idea to crochet a pie hat. 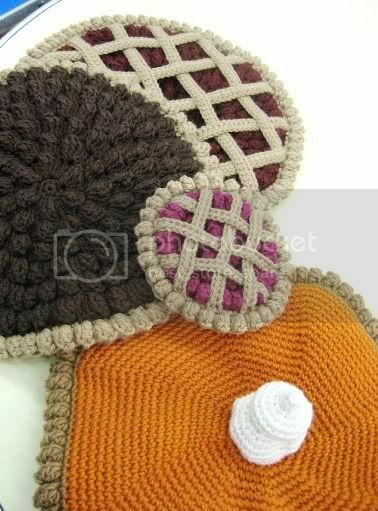 Pies, as well as being my favourite dessert, are also the perfect shape to be fashioned into a cute little tam. I practically had the pattern all mapped out in my head, and then I did a Google search to see if anyone else had thought of it. I saw a couple of unsatisfactory knitted pie hats, but they weren't really what I was looking for. I promptly forgot about it, and went on with my life.